If you and your cowboy are dreaming of a western-style wedding, here are some ideas to help you plan one helluva hoedown. The location you choose will do more than anything else to set the stage for your western theme wedding. Scout out barns for rent in your area or contact a state park that has a pavilion or cross-fenced area. Send friends and family engagement announcements in the style of a Pony Express letter or use specially printed announcements that have a western theme. Maintain the theme with your choice of wording. Instead of "Announcing the engagement of," use the words, "We're gettin' hitched!" This will set the stage for what's sure to be a rip snortin', boot stompin' good time! Why not have this party at your favorite country and western bar? If that's not possible, continue the western theme by using bales of hay, saddles, and lassoes to decorate for the party. Whether you have a DJ or a live band, a square dance number will surely set the mood. Get the dancing started by teaching your guests the "Boot Scootin' Boogie" or the classic country line dance! Serve classic western barbecue and beans, or have your party catered by a company that specializes in Texas-style fare. Use red and white checked tablecloths, use bandanas for napkins, and drink from mason jars. Decorate the tables with howling coyote candleholders for setting the western mood. Hold the rehearsal dinner at a local steakhouse or hold an outdoor barbecue at the home of the groom's parents or a local park. Present the wedding party with personalized beer mugs or margarita glasses as they toast to your future together. While a formal cowboy tuxedo may be difficult to find in some parts of the country, the men in the wedding party will certainly be well dressed in their new jeans, western vests, boots, and big hats. To set the groom apart from the other members of the party, have him wear a different color hat. Add bolo ties to dress things up! There are several styles available to the western bride. A more formal wedding wouldn't be complete with out a modern, lacy, western dress. Look for the style of Victorian gown you might see in an old time photograph. Attach the veil to a feminine western-style hat. Less formal attire can include denim skirts or new blue jeans with a white blouse that has a lace collar. And of course, no western shindig would be complete without cowboy boots! Outfit bridesmaids in western skirts and lacy blouses. Decorate their hats with broad ribbons that tie in the back with bouncy bows. When selecting flowers for your western-style wedding, keep in mind that hothouse flowers and formal arrangements would not have been available in the old west. It's best to keep floral arrangements simple-a bunch of Texas bluebonnets in a mason jar, yellow roses in a decorative boot-shaped vase, or bunches of fresh flowers in galvanized tubs decorated with a bow made out of burlap or rope. For bouquets, use long stem flowers tied together with a bit of rope. Texas spider lilies, exotic looking fleshy herbs with pointy blooms, would make a great addition to centerpieces or bouquets. Another flower choice would be zinnias. These flowers come in a variety of colors and are available throughout the US from late spring to early fall. Their tight blooms and bouncy appearance make them perfect for centerpieces and bouquets or boutonnières. 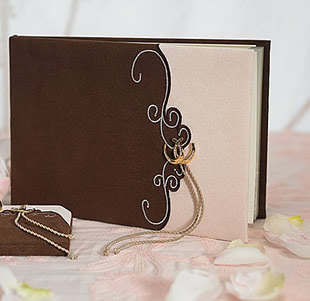 The ring bearer will certainly complement the western theme by carrying the wedding rings on a western-style ring pillow. Display the unity candle on a scroll candleholder. Have your guests sign the guest book with a western-themed pen. Hire a horse drawn wagon to transport the wedding party to the reception or arrange for an old-fashioned hay-wagon to transport guests to the reception. Bring a little of the Wild, Wild West to your reception from the music to the food to the favors. Whether you choose a live band or a DJ, be sure to specify that you want country music. Share a two-step with your new husband or perhaps have the father of the bride call out a square dance. When making toasts, ring cowbells or shout yee-haw to get the room's attention instead of clinking glasses. Reception fare can be served on long picnic tables can include barbecue, fried chicken, potato salad and baked beans. Everyone knows that wedding cake brings good luck. 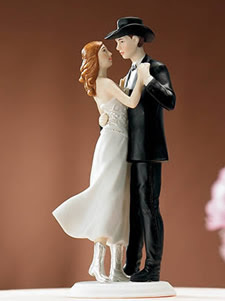 Why not decorate your cake with fresh flowers and horseshoes or have a western couple as a cake topper? Substitute margaritas and bottled beer for the traditional champagne. Have guests blow bubbles from boots as you ride off into the sunset for your honeymoon. Say thank you to your guests by sending them home with a special memento of the big day. Personalized miniature cowbells, cowboy hats, or feedbags filled with a favorite candy would be a lasting reminder of the cotton pickin' good time helping you celebrate the beginning of your lives together!